You've got a mouthful of diamonds, and a pocketful of secrets. I know you're never telling anyone, because the﻿ patterns they control your mind. Phantogram is a trip hop/electronic duo from Sarasota Springs, New York. The band is made up of vocalist/keyboardist Sarah Barthel, and vocalist/guitarist Josh Carter. Although they were friends since middle school, they didn't officially form Phantogram until 2007. 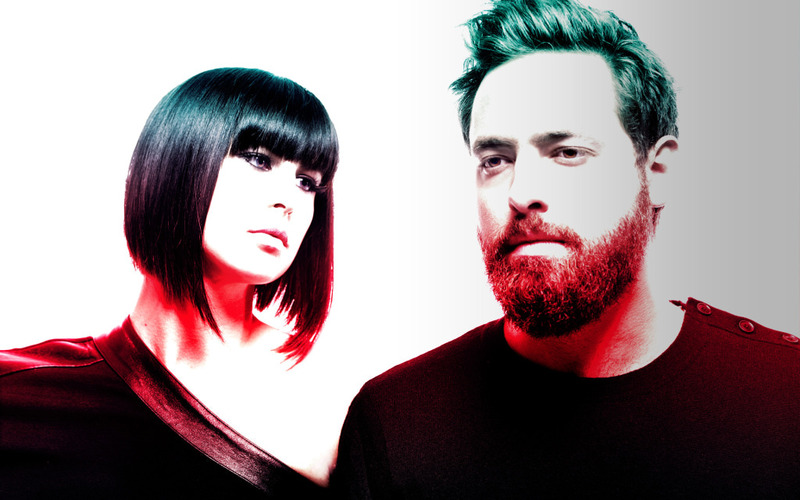 Originally known as Charlie Everywhere, the duo changed their name to Phantogram (inspired by a type of optical illusion) after signing to BBE Records in 2009. Musically, they're inspired by a wide-range of experimental, electronic and trip hop bands, like Portishead, The Flaming Lips, and Yes. They're known for employing spacey keyboard riffs with breathy, airy vocals, and synthesized beats. All of their music is recorded in a remote barn in upstate New York known as Harmony Lodge. Their debut album, Eyelid Movies, was released in 2009 on Barsuk Records. They released two EP's that same year, and their most recent release was 2011's Nightlife EP. Phantogram have toured with bands like The Antlers, Beach House, and Caribou, and are currently headlining a tour around North America. On first listen, it seems like vocalist Sarah Barthel is driving New York-based duo Phantogram. Her velvety voice is simultaneously cinematic and touchingly intimate, and she's got a knack for belting out memorable melody after melody. But then you realize this is 100% a team effort, guitarist/beatsmith/producer Josh Cartel is just making it look easy. His chilled out beats effortlessly mix hip hop, R&B and glitchy house, while he provides beds of chiming lead guitar and dreamy production. Like Portishead or Bjork, the music is such a perfect foil it vaults the vocals from great to really great. Phantogram first hit the national conscious with their 2009 EP Phantogram, and followed with the 2010 debut Eyelid Movies. A standout from both the EP and album, “Mouthful of Diamonds” is pretty simple: Carter's slinky lead guitar, a fat hip hop beat, and Barthel's ever-gorgeous vocals hanging over cozy, growling synths. Their music rides the line between dance pop hit, and dark, isolated beauty. Both from upstate New York, Phantogram records in a barn in rural New York, where you imagine they get their reflective, twinkling stars in a pitch black night vibe. The bands November 2011 EP Nightlife is aptly named; this is music for after the sun's gone down. Barthel's voice has a noir-ish tone to it as it floats rich as chocolate decadence cake above the warmly glowing synthesizers and Blade Runner electronic strings. If Nightlife is a chronicle of a night out for the band, recent single "Don't Move," which has been storming the Internets in recent months, would be the moment they make their dramatic entrance to the club. Disembodied vocal and horn samples spring all over a hip hop inflected dance beat before Barthel bursts onto the scene, singing "I'm not your nervous feeling/each time you say goodnight" in her most confident, breathy sigh. Swirling keyboards and cinematic guitar finish off one of the year's great singles. While Phantogram may not always hit the spectacular highs of their singles, they've succeeding in making darkly dreamy synth-pop that's just as compelling staring out the window of a rural cabin or quiet bedroom as the dance floor of the coolest clubs.